Elderly relatives have told me of life in the boot factories in the 1920s, the perils of “clickers”, for example, who could lose a finger or two in a press through a moment’s inattention. They also spoke of the World War I veterans of those times: the grossly disfigured and maimed “heros” of Gallipoli and the Western Front who ceased to be heros on their return home and were quickly tossed on the human scrapheap. For the working class of Melbourne’s inner suburbs in the first half of the 20th century, the dividing line between crime and the rest of life was a fine one and Squizzy Taylor lived most of his life as a criminal. What the working class of Melbourne’s inner suburbs considered crime was not necessarily what the law defined. Even before the Great Depression, unemployment was high and pilfering from warehouses, illegal gambling, sly grog, prostitution and other petty crime was part of a way of life. One of my grandfather’s brothers, a small and athletic man, was in demand for his ability to get through gaps that most people would consider too small or too inaccessible. He was known in the family as a thief, a term used without prejudice. That’s just what he did. Some probably thought a little enviously that it was better than the boot factories. He didn’t steal from friends and neighbours, but inner-suburban warehouses and big residences over the Yarra in Kew were fair game. He died quite a few years ago and is well beyond the reach of the law, as he was for pretty well all of his life. After the boot factories closed, sly grog and illegal betting were rife. One of my great-grandfathers “held the bag” (took bets and wrote betting tickets) for John Wren, and Wren paid for his hospital treatment during his final illness. One of my grandmothers ran a small book on horse races and sold small amounts of sly grog, which police raids never discovered because it was hidden under the floor. The beer probably came illegally from the area’s breweries, pubs or warehouses. This was the alternative economy of Melbourne’s working-class inner suburbs, and had been since the late 19th century. Good times were never very good in Collingwood, or nearby Fitzroy and Richmond, or parts of Carlton and South Melbourne. Hugh Anderson’s book contains much of this social history. 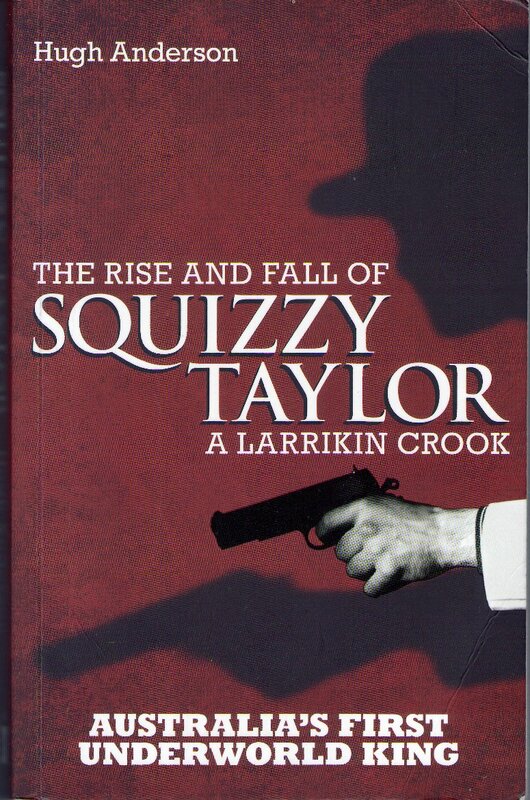 It’s not just an account of the life of Squizzy Taylor, for whom crime was a career. Taylor didn’t just pilfer to get by, as much of the working class did out of necessity from time to time. He ran a gang and organised raids on warehouses and businesses, particularly banks and jewellers. No boot factories for Squizzy. As a young man he was a jockey, and from there he progressed to picking pockets and then went on to bigger things. At his peak, before about 1924, he was able to buy off cops, hire the best lawyers, fix juries and horse races and literally get away with murder. Some of his legacy was still evident when I was a student in Melbourne in the 1970s: the legendary bullet marks in the central stairwell of the Trades Hall, and one or two pubs that were still known as former haunts of Squizzy Taylor. Anderson tells Taylor’s story well, but he also outlines the social and political conditions of the time, including incidents such as the Victorian police strike of 1923 when the underclass of the inner suburbs descended in a mob on the riches of the central business district, the labour movement campaign against capital punishment, the groanings of religious conservatives about changes in women’s social status and clothing in the 1920s, and much more. In a couple of patches the transition from social history to the Squizzy Taylor story seems a bit rough, but that doesn’t matter too much, this little book is a gem. This entry was posted on November 29, 2011 at 10:55 am and is filed under Ed Lewis. You can follow any responses to this entry through the RSS 2.0 feed. You can leave a response, or trackback from your own site. What was the name of the boot factory you redfer to? My grandfather worked at Raymonds as did manyy other relatives withthe name of Varley. My relatives worked at Llewellyns and Rampling & Hall. Llewellyns was big enough to have its own football team, which played an annual match against the unemployed association.